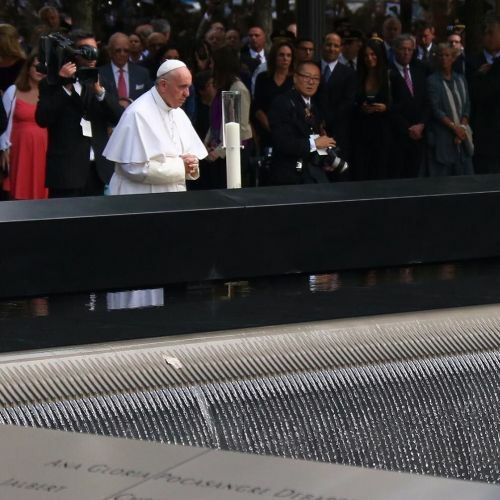 ""This is a place where we shed tears," #PopeFrancis said today during a ceremony at the @911memorial. "We weep out of a sense of helplessness in the face of injustice, murder, and the failure to settle conflicts through dialogue. Here we mourn the wrongful and senseless loss of innocent lives because of the inability to find solutions which respect the common good. This flowing water reminds us of yesterday's tears, but also of all the tears still being shed today." Follow @nytchangster, who is one of a number of @nytimes photographers covering the #popeinnyc today." By nytimes on Instagram.